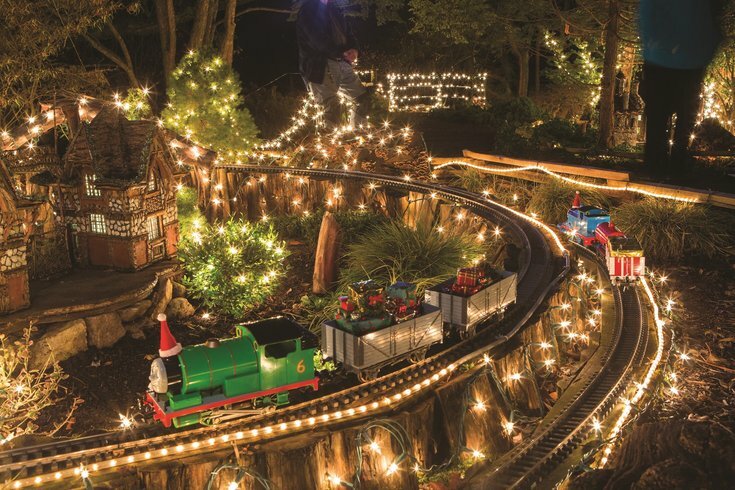 Morris Arboretum’s popular Friday Night Lights at the Holiday Garden Railway returns this year on five Friday evenings in December. The Holiday Garden Railway will open for the season on Friday, Nov. 24. For years, the miniature village and toy trains have been a family-friendly favorite at Morris Arboretum. There are 15 different rail lines with tunnels and bridges – including one visitors can walk under. Through Sunday, Dec. 31, the display will be decorated festively. Trains will be loaded with tiny gifts and the buildings and pint-sized Philly landmarks nestled along the tracks will be adorned with wreaths, bows and evergreens. The Holiday Garden Railway will run daily from 10 a.m. to 4 p.m. The only exception is Christmas Eve and Christmas Day, when it will be closed. During regular hours, the Garden Railway is free with arboretum admission. On Fridays, during the holiday season, there are also opportunities to view the railway lit up with hundreds of twinkling lights. The special event, Friday Night Lights, will take place on Dec. 1, 8, 15, 22 and 29 from 4:30 to 7:30 p.m. Tickets are required. Hot cocoa, coffee and light snacks will be available at Compton Café for both daytime and evening visitors. Morris Arboretum of the University of Pennsylvania is a 92-acre horticulture display garden located near Chestnut Hill.